To photograph for commercial and archival purposes the staircase and atrium windows (The Noble Women of Modern Times) in the west end of Liverpool Cathedral's Lady Chapel. Both windows are below ground level in a large Well off the founders plot on the south side of the Cathedral with little daylight to illuminate the glass. The staircase window is positioned on a quarter turn landing half way down to the floor level of the Chapel, with only low level access and measuring one metre wide by four metres high. 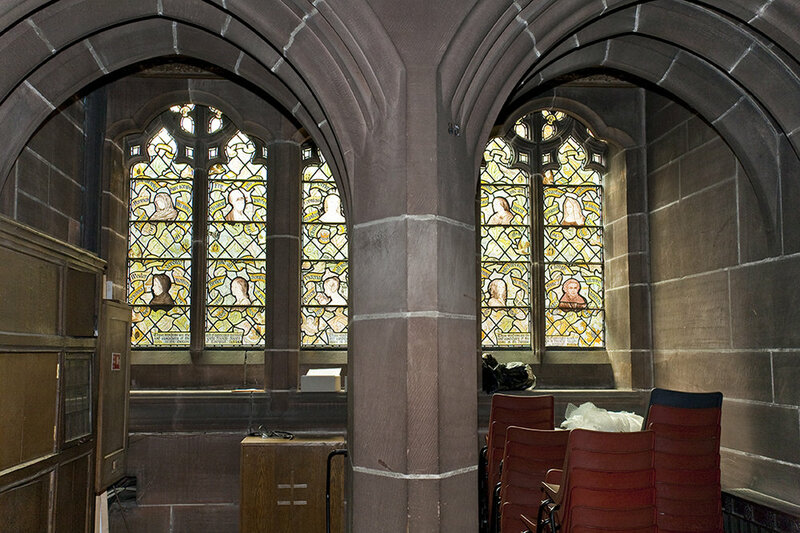 The atrium window is in the cloakroom area of the Chapel, it has a large column dividing the cloakroom area in two, this column means that it's impossible to view all of the atrium window at once. To photograph small sections of each window using the window support bars as convenient break points. After processing the images and correcting any perspective errors import the images into Photoshop and rebuild the windows. Final perspective corrected assembly of the Atrium window. The final perspective corrected assembly of the Staircase window. A Profoto 2400 freeze power pack was placed on the outside of the windows in the Well area with a Prohead and 2'x2' Softbox mounted on Manfrotto's Autopole system, the head and softbox where then positioned against the glass panel being photographed. On the inside of the Chapel the same system was employed to support the camera. The camera was then positioned to photograph the panel being illuminated by the softbox and the two systems, flash and camera, where linked together using a Quantum radio slave set. Then it was just a matter of closing the Lady Chapel to the public for a whole day! Borrowing two five meter ladders from the Cathedral's maintenance department and of course not forgetting the most critical piece of equipment for the shoot, a length of 4mm shock cord to hold a pendant lamp out of harms way on the staircase.